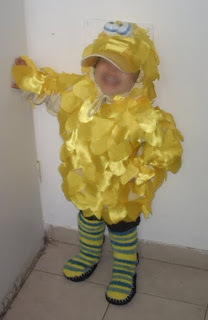 I made a Big Bird costume from scratch and it didn't cost much nor did it take much time. I am only considering actual costume material and not clothing that will have use afterward for Lee. I feel that money that becomes tied into costumes alone is wasted money, because there are only so many times one can wear a costume, but parts of a costume that are reusable as items of clothing take away from the costume price and can just be added as general clothing expenses. 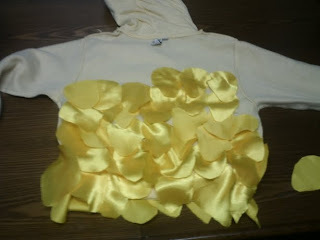 Take the yellow fabric and cut out teardrop shaped "feathers". This doesn't really need to be exact. It can be oblong, oval, egg shaped, teardrop shaped. You just want one end skinnier than the other and for at least one of the ends to be rounded. You want these feathers each to be roughly the size of a lemon. If your scissors are decent, you should be able to fold over the fabric and cut out 4-6 "feathers" at one time. Draw "pupils" on the ping pong balls with the black permanent marker. Draw a semi thick blue band around the circumference of the balls with the blue permanent marker. Turn the sweatshirt inside out to protect it. You're going to be making a costume from the sweatshirt, but if you want it to remain usable afterward, keeping the sweatshirt inside out can make it be reusable even after costume season is over. Sew the eyeballs onto the hood of the sweatshirt. You want the eyes to be above the child's forehead and as close to the edge of the hood as possible. Take the sweatshirt and lay it out on a flat surface. Lay down the feathers on the sweatshirt with the narrower side facing downward. You want these feathers slightly overlapping on another. Losely stitch them onto the sweatshirt. You want to be sewing down the wider, upper part of the feather so that the bottom can be free to flap and be "feather-like". I suggest sewing these on by hand as this makes it easier to take them all off once you're finished with the costume, and then you have your sweatshirt free and clear. 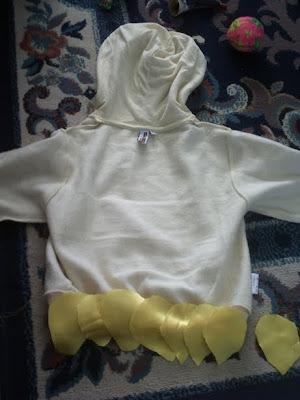 If you have less time or don't care to keep the sweatshirt for normal usage, you can attach the feathers with a sewing machine or glue. Layer more rows of feathers onto the sweatshirt. You will want to be putting the feathers so that they overlap like scales, with each narrow part of the feather hanging over the wider part of the feather below. If you sew this by hand, this will go very quickly. Each row took me approximately a minute or two to sew on by hand. First I sewed in the feathers on the back, all the way until the hood started. Then I did the same on the front. I then did the hood, starting near the drawstring in the front, working across the back, and to the other drawstring (be sure not to sew through the drawstring if you want it to work). I worked my way up the hood like this until I got near the eyes. 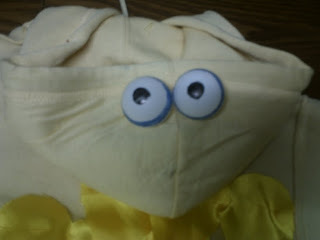 I then sewed the feathers in a circle around the eyes, with the larger parts framing the eyes and the narrow parts hanging down over the edge of the hood. I then sewed the feathers on the sleeves. I didn't bother sewing the feathers all the way around the sleeve- I was running out of feathers and felt it would be unnecessary. I ended up using rows of 4 across, all up the sleeves. 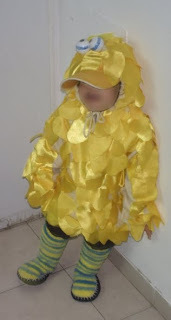 When the sweatshirt is entirely covered in feathers, have your kid wear the sweatshirt. Check, are there any places with missing feathers? Sometimes while wearing the costume, the feathers will shift and you'll see bald patches. Take note of the location of these bald patches and fill them in with the extra feathers. To complete the costume, put blue pants on the child. Put the slipper socks on top of the pants so that the stripes are visible and go up the legs like leggings. Have him wear the yellow visor and put on the hood. Close the drawstring and make sure that the hood is drawn around the visor so that only a yellow "beak" is showing. Here are the final results. I think they look quite Big Bird-esque. Now that I have no more need for the costume (our party was a few days ago), I just snipped the threads and pulled off the feathers. We now have a sweatshirt, some slipper socks, a visor to return to my sister... and a little bit of trash. Have you ever made homemade costumes? What costumes did you make? Were they reversible, or did the costumes remain costumes permanently? This post is part of Creative Jewish Mom's Craft Party Sunday. Hello colleagues, its great article about educationand entirely defined, keep it up all the time.